Since adopting Frontier to provide students with curated web-based research projects, the Title I district has seen an increase in classroom engagement and academic growth, a shift attributed to Frontier’s emphasis on student choice and creativity. Like many districts, Kelseyville was committed to meeting the needs of every learner but struggled to find the tools to do so. “I wanted to bring in more project based learning to our district, but our teachers were lacking the background and resources to implement it well. It takes so much time to bring in that sort of learning. I wanted to find a tool that could help us, and that’s how I came across Frontier,” explains Tim Gill, Director of Student Services at Kelseyville. Frontier streamlines digital research projects, providing students with curated online research aligned to student skill levels and state standards. After working through these resources, students use the notes they took throughout the process to build a creative final project with Google Slides or Google Docs. These projects are shared with peers for anonymous feedback before they’re revised and submitted to the teacher. Kelseyville piloted Frontier in the summer of 2016, initially launching 100 students on the web-based platform. Using Frontier for 60-90 minutes each week, students were able to complete an average of 3 in-depth research projects by the end of the summer, practicing essential reading and writing skills while become experts in topics that mattered to them. 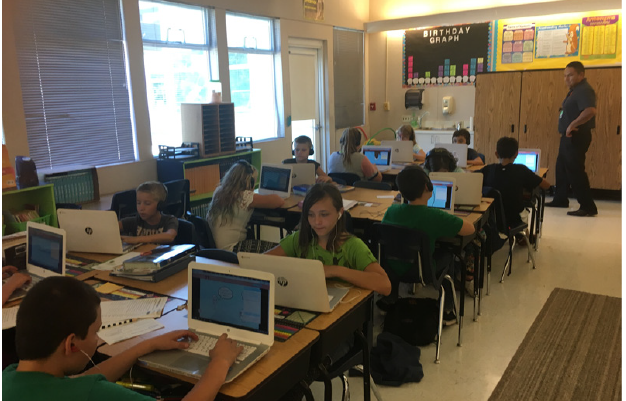 As one of the first districts to use Frontier, students, teachers, and administrators at Kelseyville had the opportunity to shape product updates and new Frontier topics with their feedback and suggestions. “They loved it. The level of engagement with Frontier was very high from the beginning with both teachers and students. Teachers were telling me that kids came to class asking to do more with Frontier,” says Tim Gill. "The level of engagement with Frontier was very high from the beginning with both teachers and students. Teachers were telling me that kids came to class asking to do more with Frontier." Thrilled with the success of the summer Frontier pilot, district leaders at Kelseyville decided to expand the program to 550 fifth through eighth grade students. Teachers at Kelseyville are excited about how much simpler Frontier makes digital research projects. Rather than spending hours each week planning differentiated research prompts, vetting resources, and modelling successful creative projects, teachers are free to work with small groups and individuals to ensure that students are truly creating their strongest work. “What I like about Frontier is that it gives students choice, which is often difficult to do for them as a regular classroom teacher… As for what it takes off of my plate, well, I don’t have to create as many writing assignments. (Frontier) basically creates them for me,” says Jen Conrad, a middle school teacher at Kelseyville. What’s next for Kelseyville? The district is keen to measure the full academic impact of Frontier by tracking student growth on the Smarter Balanced assessment. Educators at Kelseyville believe that Frontier’s open-ended creative projects will prepare students to excel at the notoriously challenging activity level questions featured throughout the next generation assessment. Furthermore, the district hopes to better celebrate student work by sharing Frontier projects with “the school, community, and school board,” says Tim Gill. In the meantime, students continue to tackle complex questions such as “Should all school teach students how to code?” and “How are animated movies made?” Working through engaging online research aligned to their individual learning levels, Kelseyville students are well on their way to developing a lifelong love of learning and the ability to apply what they learn in school to real-world problems. "When I walk into a classroom that's using Frontier, kids are fully engaged. They love it." How student choice and creative projects are engaging learners in Mineola Public Schools.